For nearly 300 years the little crunchy macaroon decorated with sugar crystals has been an Italian favorite. 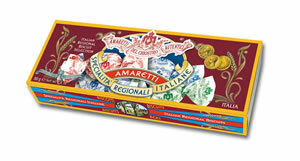 Crunchy Amaretti is from the town of Sarono in Lombardy. Contains eggs. May contain traces of almonds. Wheat and gluten free.